California State University, Northridge will confer honorary doctorates on financial journalist William C. Griffeth and substance-abuse educator Michael Watanabe, president and CEO of Asian American Drug Abuse Program (AADAP). Griffeth, currently anchor of the financial news show “Closing Bell” on CNBC, will receive an honorary Doctor of Humane Letters during the Mike Curb College of Arts, Media, and Communication commencement ceremony on Friday, May 19. Watanabe, a recognized leader in the field of substance-abuse education, prevention, intervention and treatment, will receive an honorary Doctor of Humane Letters during the commencement ceremony for the College of Social and Behavioral Sciences on Sunday, May 21. Griffeth and Watanabe are CSUN alumni. “I am pleased to honor Bill Griffeth and Michael Watanabe for their significant contributions to society, and to CSUN,” said CSUN President Dianne F. Harrison. “Bill Griffeth is a respected anchor and financial journalist with CNBC and a true pioneer of his field,” she said. “He has more than 30 years of experience in business television and is one of the most prominent financial journalists in the country. Despite his busy professional life, Bill gives tirelessly of himself to his alma mater and in particular to our students. 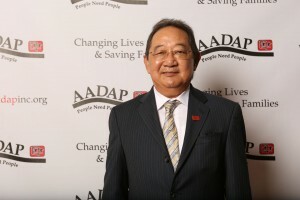 “Michael Watanabe embodies the mission of AADAP, changing lives and saving families through powerful substance abuse programs and social services,” Harrison continued. “Through his inspirational and caring leadership, he has had an extraordinary impact on the community, particularly those who have been affected by drug abuse. His overall achievements reflect the objectives and ideals of the California State University system, which he learned during his time as a student at CSUN. “I am personally grateful to both honorees for their enduring connection to CSUN and the broad impact both have had on society as a whole,” she said. Griffeth, who earned his bachelor’s degree in journalism from CSUN in 1980, anchors for CNBC in New York. He is known for his quick wit and ability to think on his feet, as well as his extensive knowledge of the financial markets and market history. Griffeth was part of the production team that, in 1981, started the Financial News Network (FNN), the first cable channel devoted to business news. During his 10 years there, he was nominated for a Cable ACE award as the best news anchor for his work during FNN’s coverage of the stock market crash of 1987. In 1991, when NBC purchased FNN, Griffeth joined CNBC. He has anchored a number of programs for the network, including “Market Wrap,” “Mutual Fund Investor,” “The Money Club,” “Power Lunch” — which he co-hosted with CSUN alumna Sue Herrera — and his current assignment, “Closing Bell.” During this time, he has garnered six more Cable ACE nominations. Griffeth also has written four books, “Bill Griffeth’s Ten Steps to Financial Prosperity,” “The Mutual Fund Masters,” “By Faith Alone: One Family’s Epic Journey Through American Protestantism” and, most recently, “The Stranger in My Genes: A Memoir,” in which he shares the personal and wrenching experience of discovering through a DNA test that the man he thought was his father was not. 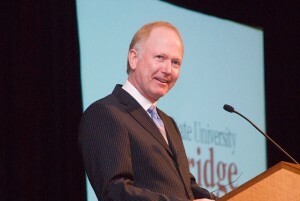 Griffeth received CSUN’s Distinguished Alumni Award in 2008. He serves on the CSUN Foundation Board of Directors and served on the CSUN Task Force on Engagement. Born in Hawaii and raised in Venice, Calif., Watanabe graduated from Venice High School during the 1960s. He served two-and-a-half years in the U.S. Army, including a tour in Vietnam as a helicopter crew chief. When he returned home, a growing concern about the impact drugs were having on his friends and community inspired Watanabe to go to college. He earned a bachelor’s degree in sociology from CSUN in 1973. After graduation, he entered the Master of Social Work program at UCLA with a National Institute of Mental Health scholarship to study substance abuse. He graduated two years later. During his studies, Watanabe was introduced to the work of the AADAP, a nonprofit dedicated to serving Asian Pacific Islanders and other underserved communities, with substance abuse services throughout Los Angeles County. A newly minted master’s degree in social work in hand, Watanabe joined AADAP’s staff in 1975, and he has been there ever since. His success at the agency led to his appointment as president and CEO for the past 34 years. Under his leadership, the organization has grown from a moderate-sized entity to a large, comprehensive agency serving a significant portion of Los Angeles County at 10 sites. Watanabe’s contributions to the community do not end with AADAP. He is the past president of the Asian Pacific Policy and Planning Council, a Los Angeles-based consortium of 45 community-based agencies serving the Asian Pacific community, and he chaired its drug, alcohol and tobacco committee for 12 years. He has served as a commissioner for the Los Angeles County Narcotics and Dangerous Drugs Commission; chaired the Asian and Pacific Islander Constituent Committee; served on the advisory board to the California Department of Alcohol and Drug Programs; and is a founding board member of the National Asian Pacific Families Against Substance Abuse. Watanabe also has been a member of the Crenshaw Chamber of Commerce, Crenshaw Neighbors and the United Way Western Regional Council of Executives.